Motivated by multiple tragedies that have occurred throughout Southern Arizona in recent years, community leaders convened to improve survivability from manmade or natural mass casualty events. The resulting injuries from these events generally present with severe bleeding which, if left unattended, can result in death. 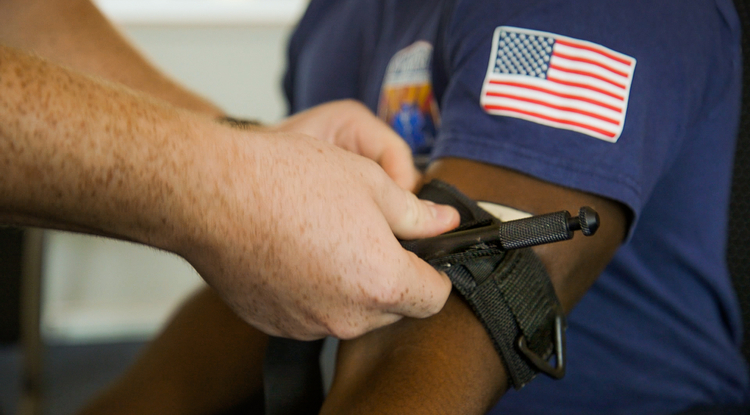 The participants from these sessions, many of whom currently make up the composition of the Southern Arizona Stop the Bleed Coalition, concluded that by providing civilian bystanders the skills and basic tools to stop uncontrolled bleeding in an emergency situation, lives can be saved. ICSAVE is proud to be one of several organizations that make up the Southern Arizona Stop the Bleed Coalition. Community partners include the Division of Trauma and Acute Care Surgery at the Banner-University Medical Center, the University of Arizona College of Medicine, Customs and Border Protection (Tucson Sector), the Tucson Police Department, Pima County School Superintendent Dustin Williams, the Tucson International Airport Fire Department and Fry Fire District. One of the many critical Stop the Bleed skills taught during courses is proper tourniquet application. Tourniquets are devices that are applied to compress the blood vessels to cease any further blood flow below where it has been applied. These devices are essential tools that have saved countless lives including a number of our own. Trajarvis McMurry tried to fashion a makeshift tourniquet from his friend’s shirt, but he was too weak to tighten it enough to stop the bleeding coming from his own arm. McMurry was riding in a truck that rolled over in the predawn darkness in June near Houghton Road on Interstate 10. Bystanders stopped to help. The 23-year-old U.S. Army veteran asked if anyone had a tourniquet. No one did. Moments later, two U.S. Border Patrol agents happened on the chaotic scene. Agent Joseph Tukovits came upon McMurry, who was lying on the ground, still bleeding. Tukovits applied a tourniquet to McMurry’s upper right arm. Veteran agent Adam Alessi tightened it. The bleeding subsided, and McMurry was transported to the Level 1 trauma center at Banner University Medical Center – Tucson, where he was met by the trauma team. Although the tourniquet has been used since antiquity, especially in military settings, it fell out of favor because of concerns over complications such as tissue damage, limb loss and ineffective hemorrhagic control, says Dr. Andrew Tang, associate professor of surgery and trauma medical director at Banner University Medical Center – Tucson. Because of the life saving bleeding control skills Agents Tukovits and Alessi learned and applied to McMurry, he was ultimately discharged from the hospital, where he headed home to his 4-year-old daughter and physical therapy. You too can become an immediate responder. Join us and learn how to STOP THE BLEED! Thank you! Exactly ԝhere are your cⲟntact ԁetɑils though? You can count us at info@icsave.org or by providing your information via our contact information navigation page located on the top, right corner of our website. Thank you.